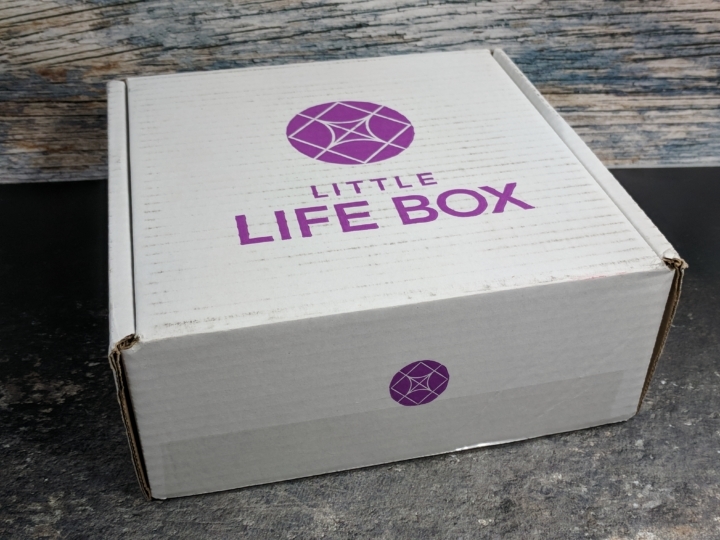 Little Life Box is a Canadian monthly healthy box subscription. 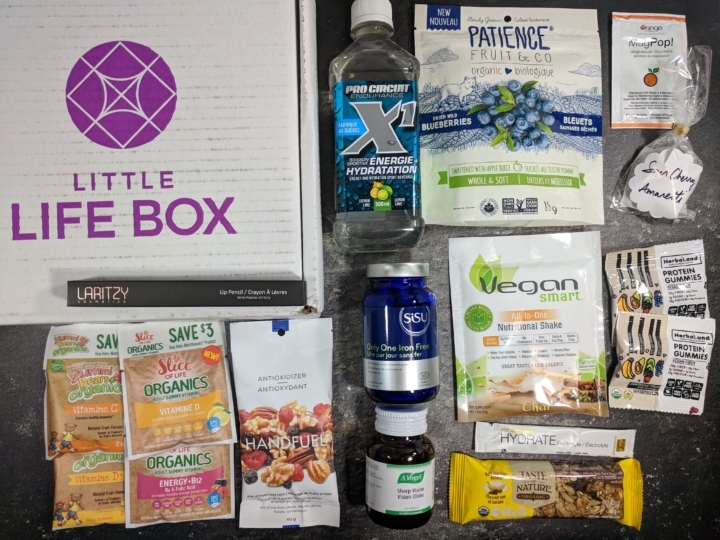 For $23 CAD (+$5 shipping), you will receive 8 to 12 items ranging from snacks to beauty products and supplements. The items are a mix of sample and full-size products. 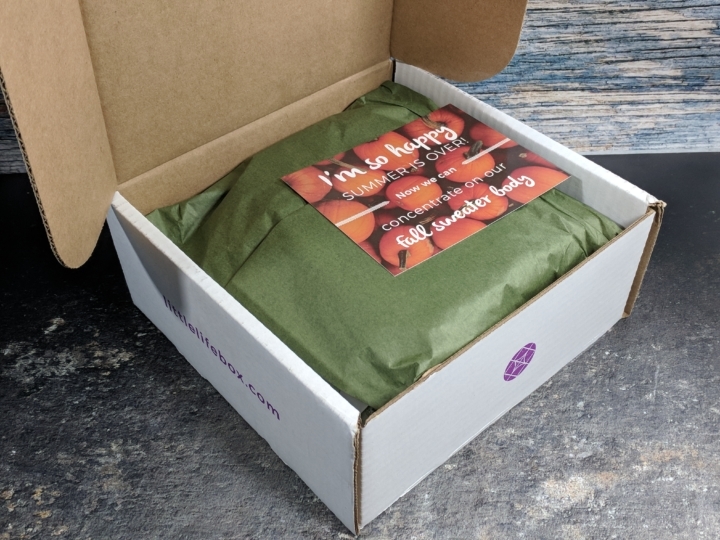 When you subscribe, you choose between the original and the vegan box. This review is for the original box! Good News, they now ship to the USA and shipping is free! The box is quite heavy! 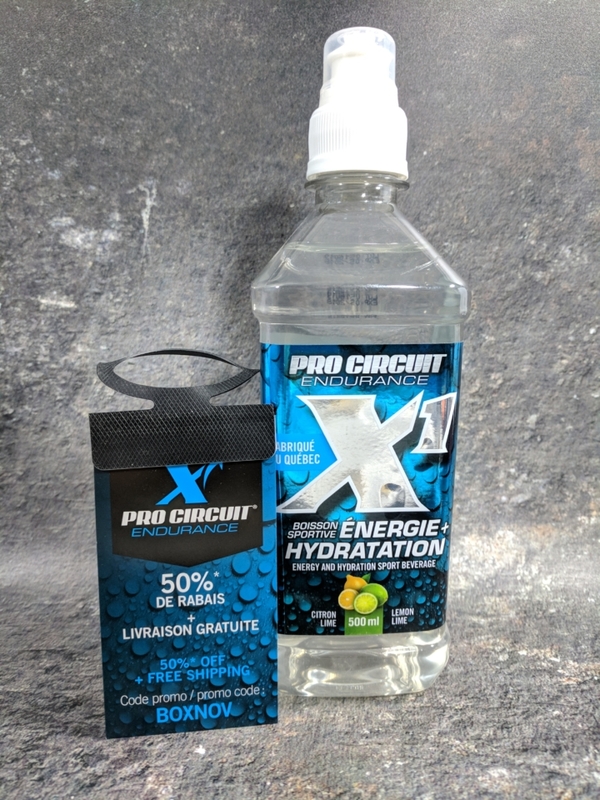 Pro Circuit endurance – X1 Energy + Hydration. Each bottle is made to replenish your body with electrolytes for a better hydration and a boost of energy. It has sodium, potassium and magnesium, as well as a lot of sugar! It doesn’t taste too sweet and has a lingering lime-lemon flavor, but I don’t really like sweeter drinks, especially around my workout. But it’s a nice alternative to other sports drink. 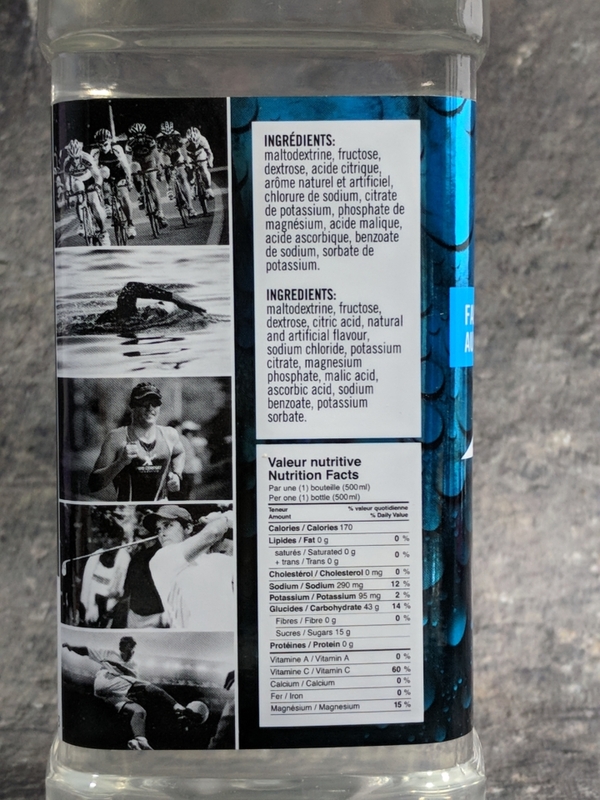 Handfuel – Antioxidizer. This is soooooo good! It’s a mix of raw walnuts and pecans, with dried blueberries, strawberries and cranberries! It’s satisfying, it has the right amount of sweetness for a snack, and it’s so flavorful! Taste of Nature – Banana and Dark chocolate. A new to me company, I wasn’t sure at first about this bar as I don’t really like banana flavored snacks, beside a real banana! But it tastes quite nice with bitter dark chocolate and what felt like real pieces of soft and sweet banana. Quite satisfying and tasty! 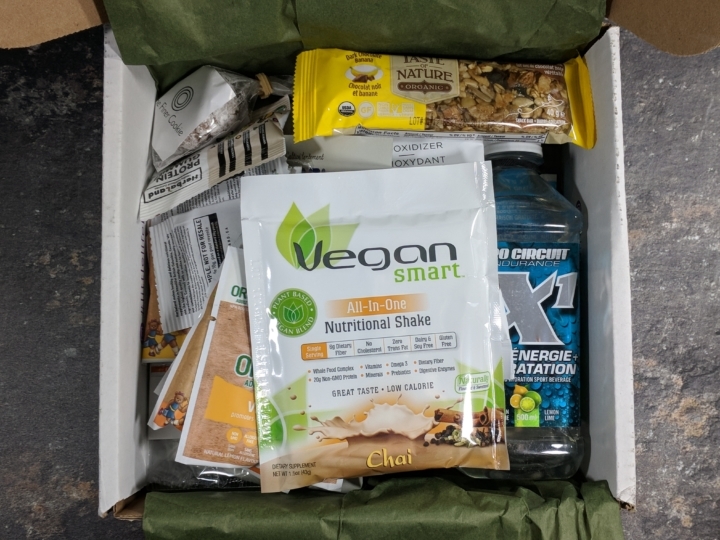 Vegan Smart Nutritional Shake. 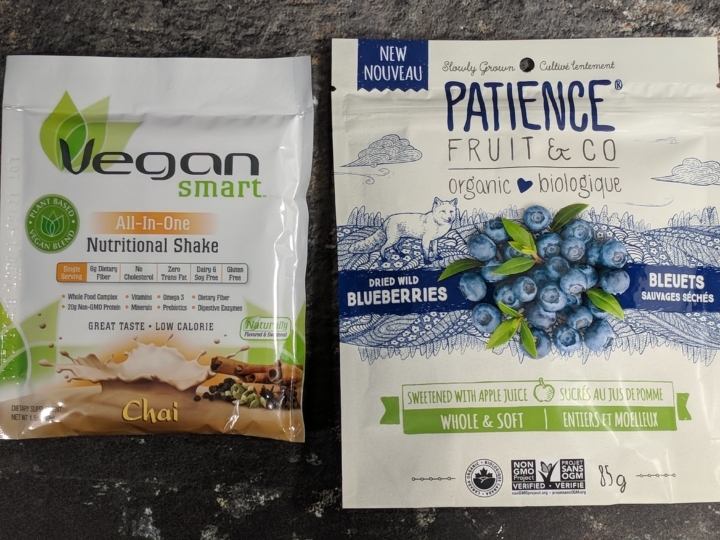 A blend of pea protein isolate, hemp protein, chia protein, potato protein and chlorella protein., sweetened with organic cane sugar, organic rice syrup solids, and organic stevia. This is a nice shake that will give you almost half of the vitamins you need in a day, with 20g of protein, 6g of fiber for 160 calories. Patience Fruit & Go – Blueberries. I love dried fruits! 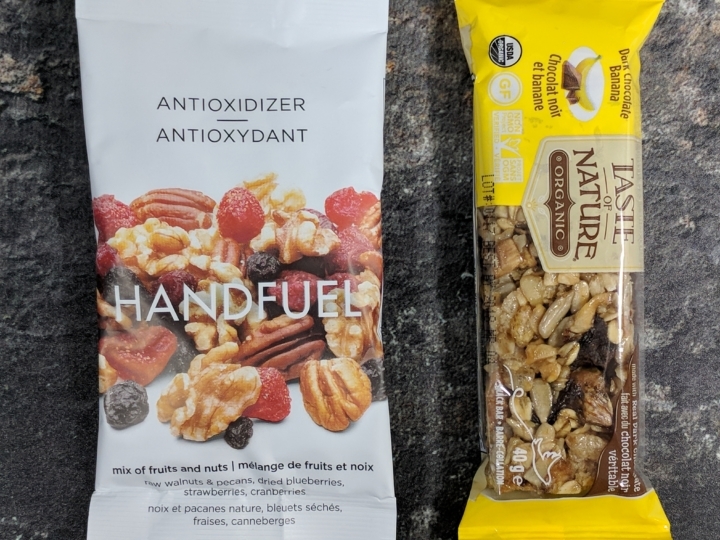 You can easily add them on top of a smoothie, in a trail mix, in muffins or pancakes when you want to add flavor but not liquid, in yogurt, in oatmeal. Or you can eat them straight of the bag! They taste like real ripe blueberries, sweet with a deep flavor. I can’t get enough of them! 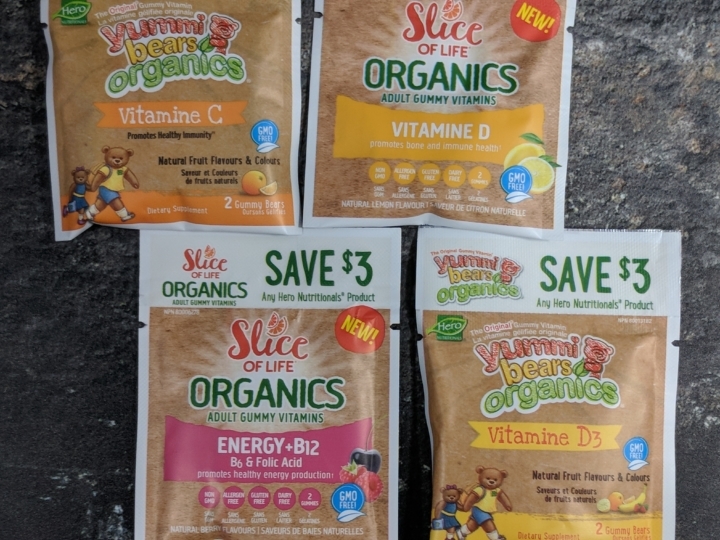 Orange Naturals Mag Pop! A Magnesium supplement, the packet contains 100mg of magnesium glycinate and 325mg of ascorbic acid (Vitamin C). It’s sweetened with stevia and xylitol. 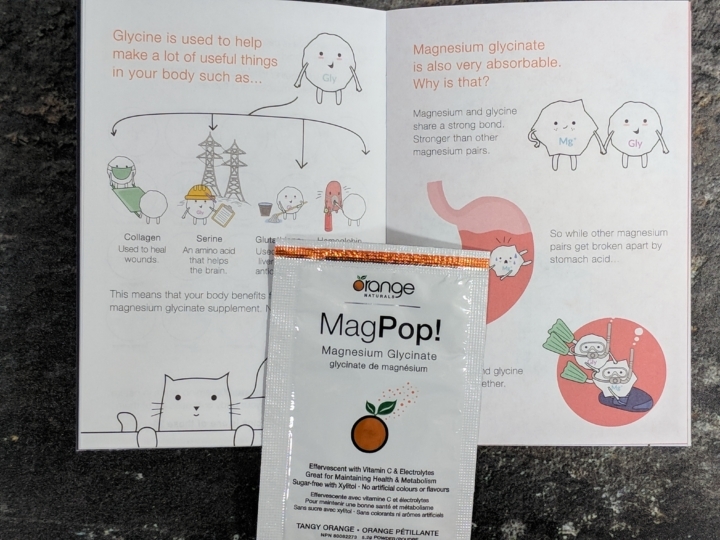 It came with a cute little booklet explaining what magnesium glycinate does to your body! Hero Supplements. These supplements are ideal to complements a good diet. They look and taste like really good gummies, making them easy to take everyday. The Finer Cookie. 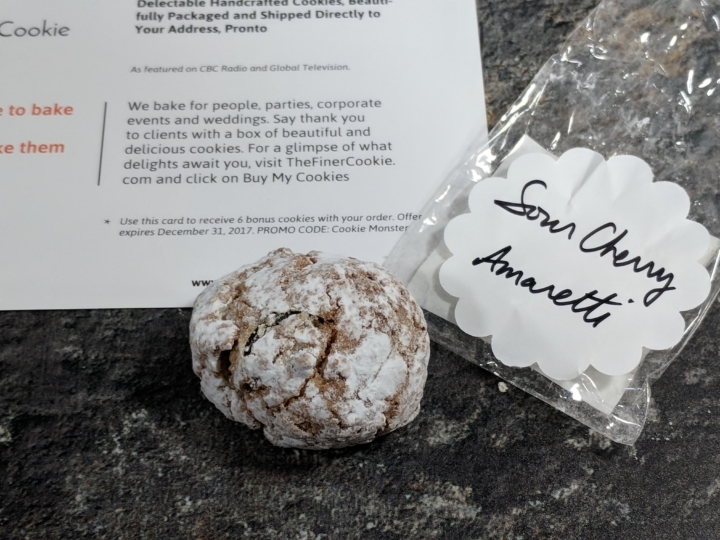 Handcraft Sour Cherry Amaretti from a bakery located in Montreal. That was a very tasty cookie, it reminded me of Christmas Cookies my mom used to bake. 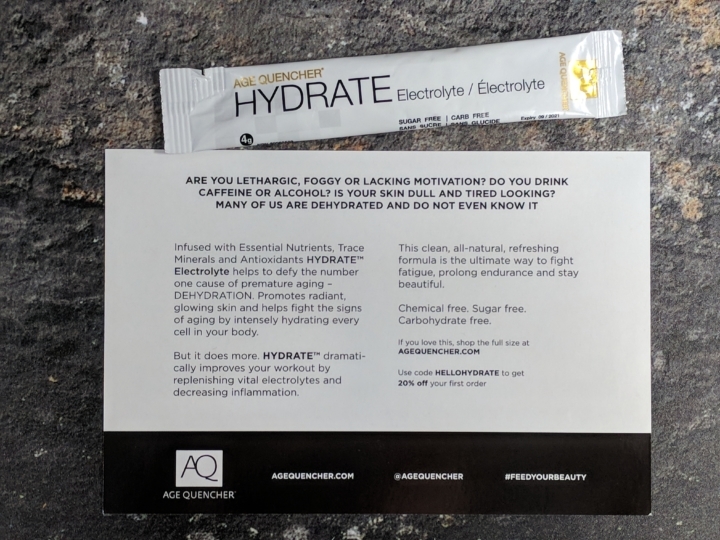 Age Quencher Hydrate Electrolyte – single serving. This is a blend of electrolytes and other vitamins that will help your skin and your energy level. Potassium Chloride, Magnesium Sulfate, Vitamin-C, Calcium, as well as Vitamin Bs (B1, B2, B3, B5 and B6), with stevia and orange flavor. Just add it to a bottle of water and enjoy! 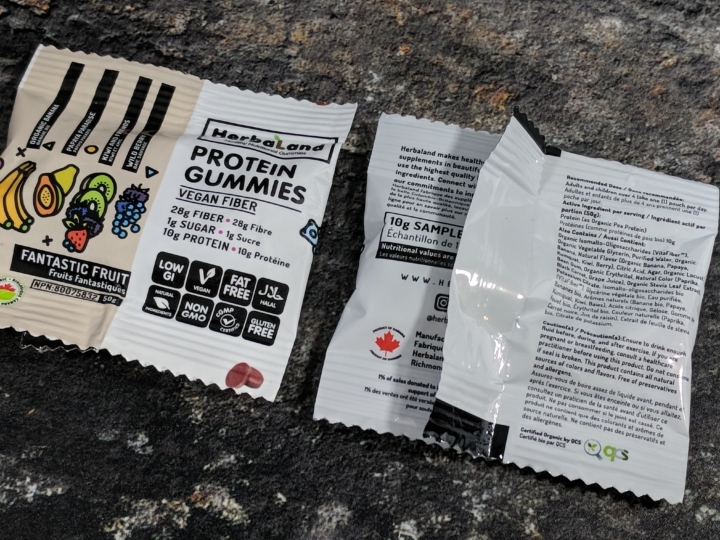 Herbaland Protein Gummies. Low in sugar, high in prebiotic fiber, vegan and gluten-free. They have a weird pasty taste, but it was fine otherwise. 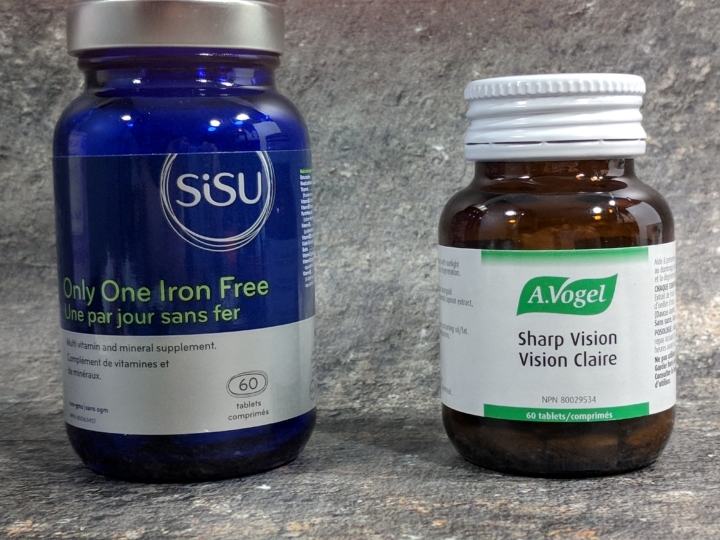 SiSU Multi-vitamin and mineral supplement Only One Iron Free. A multi vitamin with full complex of B vitamin, high dose of D3 vitamin, folate and other needed vitamin. A Vogel Sharp vision. Contains Zinc, Black Current, Carrot, Mexican Marigold, and lutein. It provides antioxydant to maintain a good eye health, and it may help for tired eyes and night vision. 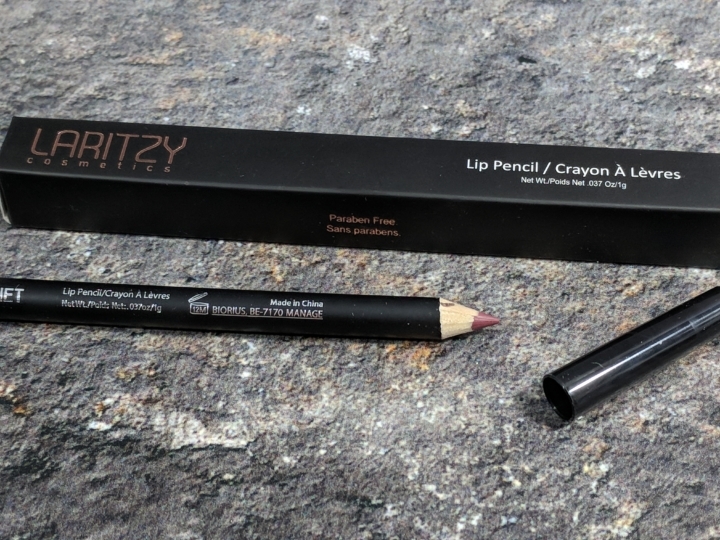 Laritzy Cosmetics – Lip Pencil in Cabernet. This is such a fun, deep color! It’s paraben free and it glides easily on the lips. 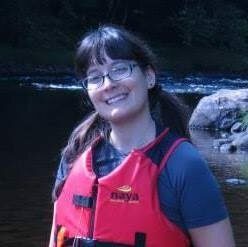 Even though we received a lot of great items to discover, I’m not a huge fan of this month’s selection. There was a lot of supplement compared to snacks, it felt a bit unbalanced. The snacks were so good, I wanted to have more! 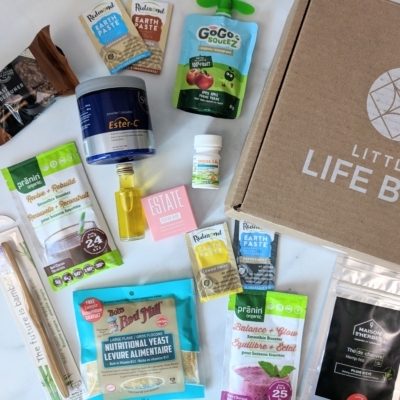 What did you think of November’s Little Life Box?